Do you have a problem with drainage or erosion? Are you concerned that Council might visit and order work to be performed on your property due to older, deteriorating sleeper walls? Has the mulch on your gardens all but disappeared? We aim to deliver quality retaining options at affordable prices. I can give you ideas for how to make your property function well and look great. I can build you sandstone steps and letterboxes, and walls made of various durable materials that will gain the admiration of your neighbours and satisfy Council requirements at the same time. 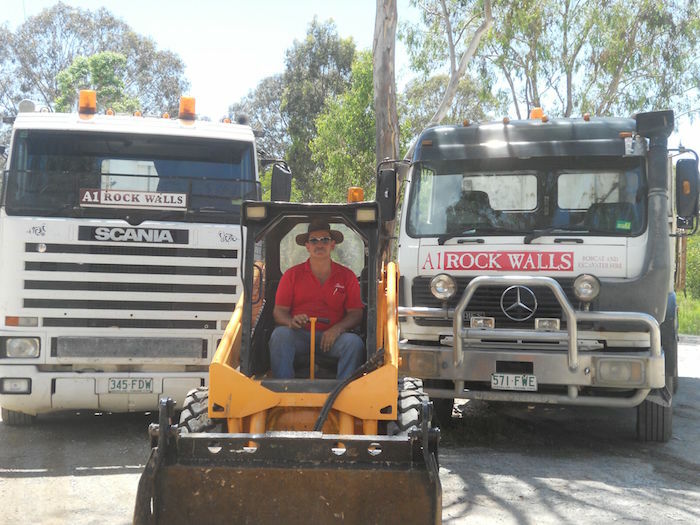 A1 Rockwalls a small, family-owned local business who, together with a small team, supply the earthmoving and retaining requirements of the area. Our business is about clearing, site cuts, the building of retaining walls and the landscaping of building or existing home sites to minimise erosion, mainly for residential clients. We also provide timber, colourbond and pool fencing where required. We can supply materials from drainage gravel, topsoil, fill and mulch of different grades. We design and construct retaining walls of different types, mainly rock walls but also link block using Boral Building products, besser blocks, sandstone, bush/granite rocks, timber/concrete sleepers. Any retaining walls over 1 metre in height require engineering design and through the certification process must be approved by local Council. We work closely with Town Planners when required by Council and have good working relationships with them. All retaining walls are constructed as per engineering requirements using drainage gravel covered with geofabric and agg pipe as required. This is to allow an exit path for any water that may wind up behind the wall.We service the Sunshine Coast and Greater Brisbane Areas in Queensland, Australia. Contact Us to get a quote for your specific work today. The team at A1 Rockwalls is waiting to hear from you. Please contact us for an appointment to get a quote for your work.